Venture off the highway and back in time. One of the things I love most about travelling is the discovery of new gems in the most unexpected places.This happened to me recently on a road trip across Ontario’s Southwest. En route to Windsor, we decided to spend a night in Chatham-Kent at the Retro Suites Hotel. A friend who is notorious for travelling with style insisted that a visit to this hotel was a must if ever in the area. So, we ventured off the highway and made our way to town’s historic downtown district. Let me just say it was worth the drive to Chatham! Based on her recommendation, I knew something great was awaiting us but I was in no way prepared for what we found. From the moment we pulled up to the front door of this boutique hotel, it was apparent the building has been painstakingly and lovingly restored to its former grandeur. 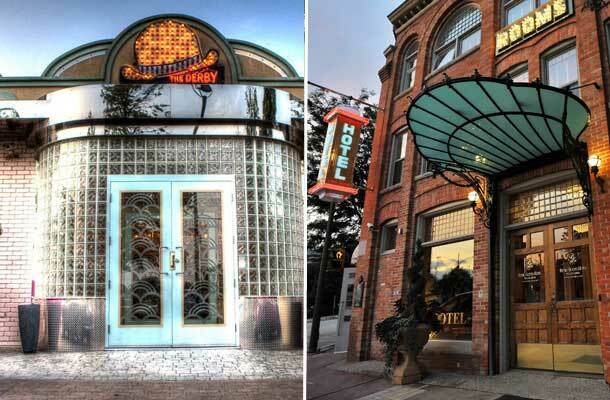 The pristine brick façade, solid wooden door and large glass windows suggested a curious tale from days past. Situated at the corner of King and William Streets (known as the King William Block), the century-old building has undergone a series of renovations since it first became the George Stephens hardware store in 1888. Today, it houses the hospitality suites of the hotel, combining historic elements of the block with modern amenities. For example, the staircase in the hotel’s lobby dates back to 1895, when it was a part of the Merrill Hotel, while the terrazzo floors and tin ceilings, along with the contemporary art and furnishings, give the Retro Suites Hotel its unique, modern appeal. The moment I walked in, I was whisked away to a world of whimsy and unapologetic luxury. The juxtaposition of classic architecture, fine antiques, modern art and art deco touches offers a vibrant sensory experience for hotel visitors. And, that’s just the lobby! The entire hotel serves as a museum of sorts for its owner’s vast collection of art and furnishings. 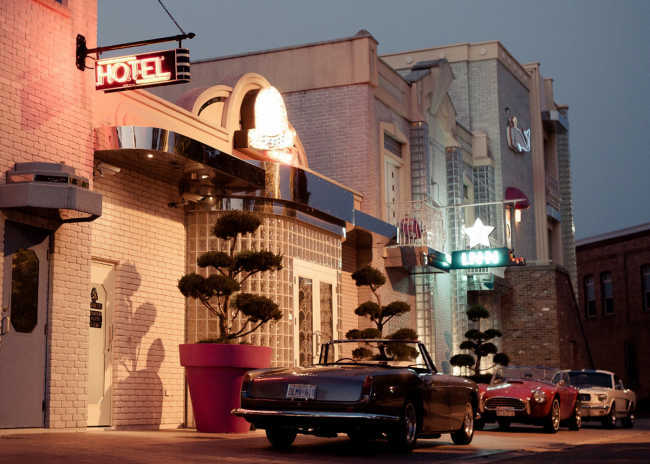 Owned by Rob Myers, the founder of RM Auto Restoration and RM Classic Cars, the hotel was originally built to accommodate the thousands of visitors who came to Chatham-Kent every year for the world-renowned classic car auctions. Today, the hotel plays host to corporate and leisure travellers and serves as a destination for weddings and other events. 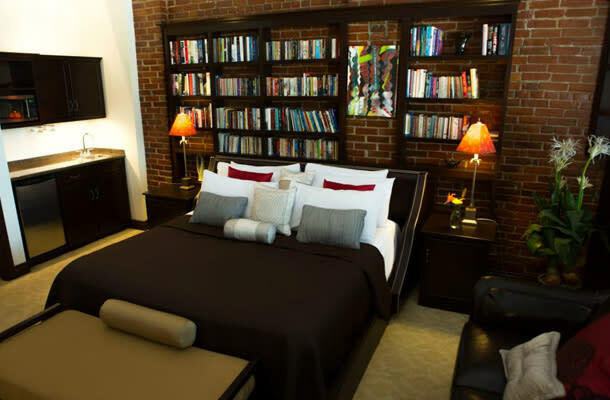 There are 34 individually designed suites that make use of the unique architectural features of the building, including exposed brick walls, loft-style ceilings and large, custom-built washrooms. All suites are furnished with contemporary furniture, luxurious bedding and chic bathroom amenities … and some even come equipped with fireplaces. We stayed in the spacious yet cozy Chardonnay suite. There are many great dining destinations in Chatham-Kent. For dinner, we ventured out to the Chatham Breakfast House and Grille. This Portuguese Churrascaria was hopping with hungry diners and the food was to-die-for delicious. The following morning, we enjoyed a locally source breakfast at The Chilled Cork, which is located adjacent to the hotel. We were very pleasantly surprised by our stay at the Retro Suites Hotel. Not only was the hotel gorgeous and comfortably adorned, the staff went above and beyond to ensure our stay was enjoyable and memorable, even offering us a tour of the presidential suite and other areas of the hotel. We were sad to leave and plan to visit again soon. Next time, we hope to explore the surrounding area a bit more, visiting local wineries, farms and lavender fields.